When the second question has been asked about President Obama, pundits have been quick to point out that an overwhelming majority of the people think that the country is moving in the wrong direction. This holds true now, even when the president’s popularity and job approval are nudging towards 50%. In a recent Occasional Planet poll* the overwhelming plurality of respondents said the country is not moving in the right direction. In order to get a better sense of what is a more reliable answer about whether the country is moving in the right direction, we need to drill down on two levels. 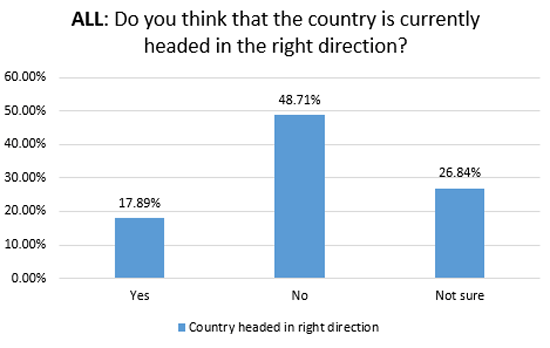 First, we need learn more from the respondents who said that the country is moving in the wrong direction. 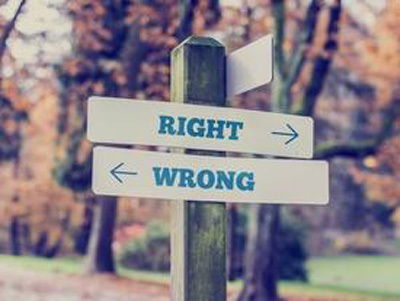 Is the country moving too far to the right, or to the left, or someplace else? Second, we need to see the breakdown to the answers by political party. The answers to the questions are revealed, at least in part, in Figures ‘B’ and ‘C’. The big vertical red bar in the middle is percentage of Republicans (73%) who think that the country is headed in the wrong direction. Next to it is the relatively low (31%) of Democrats who think that we’re headed in the wrong direction. 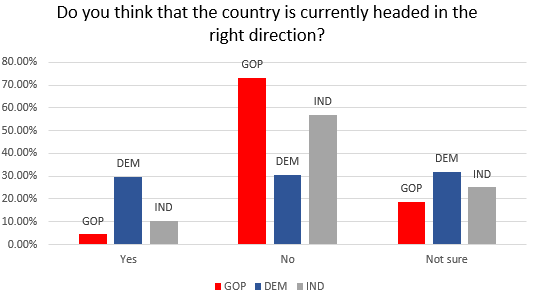 And perhaps predictably, right between the Republicans and Democrats are the Independents who have a more moderate view (57%) of the direction in which we’re moving. The results here are not surprising. 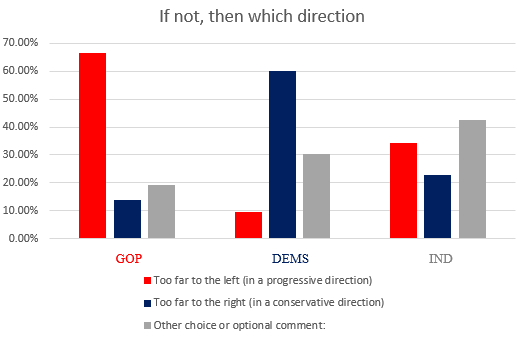 Republicans (the group on the left side of the chart) think that the country is moving too far to the left., Democrats (the group in the middle), predictably think that the country is moving too far to the right. And Independents, the group to the right, tend to think by a margin of 34% to 23% that the country is moving too far to the left. It is fairly irresponsible of the media to report that if a plurality or majority of Americans think that the country is moving in the wrong direction that it is an indictment of any sitting president. Republicans, Democrats and Independents all said that the country is not moving in the right direction. Each group wants the country to move in the direction that they favor. Thus, a substantial number of President Obama’s supporters may also say that they do not think that the country is moving in the right direction because they want a more progressive agenda. Where this all plays out in terms of relating public opinion to a policy direction that would be advisable seems to rest in the hands of Independents. As we continue this series, we will focus more on the thoughts of Independents.